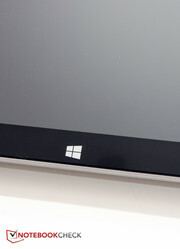 Despite a rather sluggish start, Windows 8 has paved the road for touch-enabled devices. 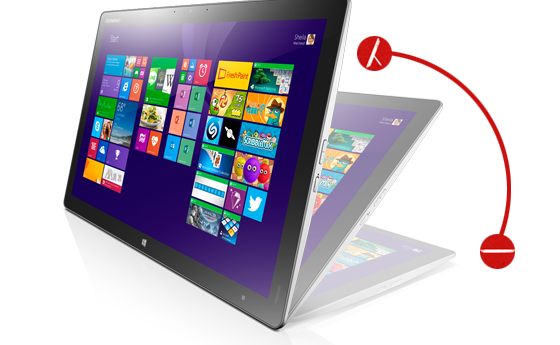 Almost every manufacturer now offers Ultrabooks, multimedia laptops and mainstream notebooks with Microsoft's OS and touchscreen control. While traditional desktop systems are seemingly heading towards extinction, we've recently seen a resurgence of AOIs - All-In-One PCs - which combine sleek looks with a space-saving design. Lenovo's latest entry, the 21.5-inch Horizon 2e, actually straddles two segments, as it is both a All-In-One PC and - thanks to the integrated battery - an oversized tablet. Our review system sports a 4th generation i3 Haswell processor, 4 GB of RAM, and a 1 TB conventional hard drive and sells through various retail outlets for around $750. On their webpage, Lenovo offers two additional models differentiated only by the processor - either the i5-4210U or the i3-4030U. 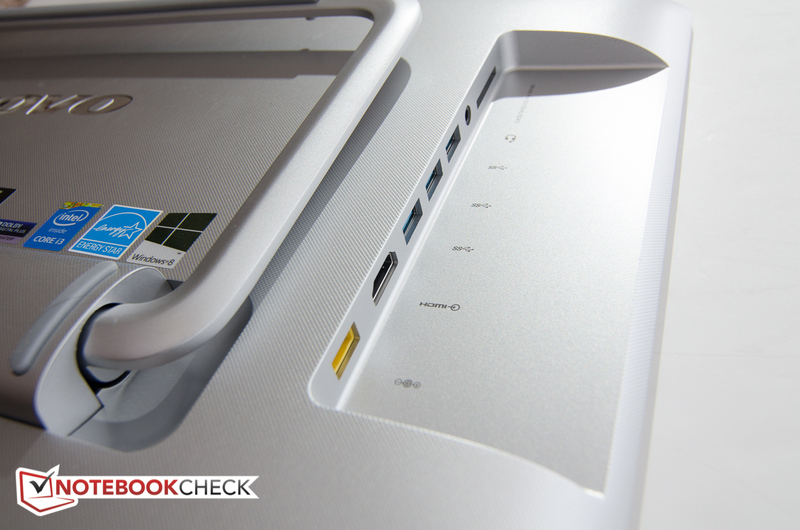 Unlike our review version, the online models come with a 1 TB hybrid hard drive, which includes 8 GB of SSD cache as well. At the time of writing, both of these versions are offered for the same price of $900, making the choice a no-brainer, although the normal price difference of $50 is quite fair as well. The concept of an AIO with integrated battery isn't exactly new: in the first half of 2013, we took a look at the 20-inch Sony Vaio Tap 20 and the 18-inch Dell XPS 18. 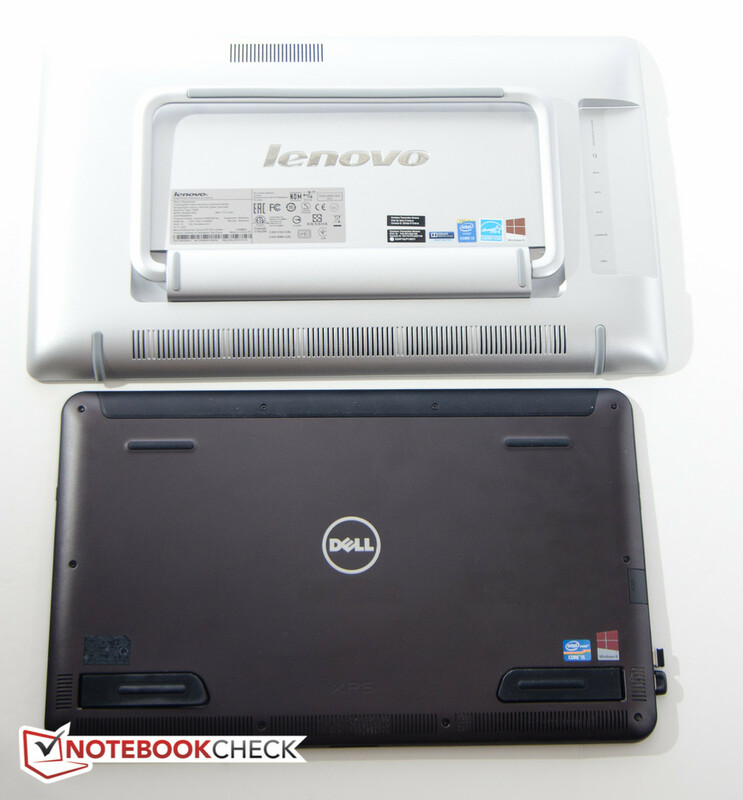 So how useful is the 21.5-inch device and does it offer any benefits over the competition? On their webpage, Lenovo advertises the Horizon 2e a "Two-in-One Tabletop PC". Just like the Sony Vaio Tap 20, the Horizon 2e features an integrated stand, which allows the system to be propped up at an angle of up to 73 degrees maximum. Alternatively, with the stand retracted, the Horizon can also lay flat on the table. Personally, we'd like to see the option of an external stand like the one that Dell offers for the XPS 18, as it would allows the top edge of the display to sit higher in a more ergonomic position. Overall, the design works well though with an infinite adjustment range and a solid hinge design that's stiff enough to hold the tablet securely. The back of the AOI is made of textured silver plastic with rounded corners, which keeps sweaty fingers from slipping. 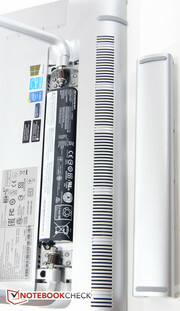 The battery sits underneath a cover between the anchor points of the stand, which means that a replacement is possible without taking off the back cover. The battery / stand area is where we measured the maximum thickness of about 40 mm; the overall thickness elsewhere tops out at about 28 mm. The front is dominated by the glass-covered, 10-point multitouch display, which also features a non-glare coating. 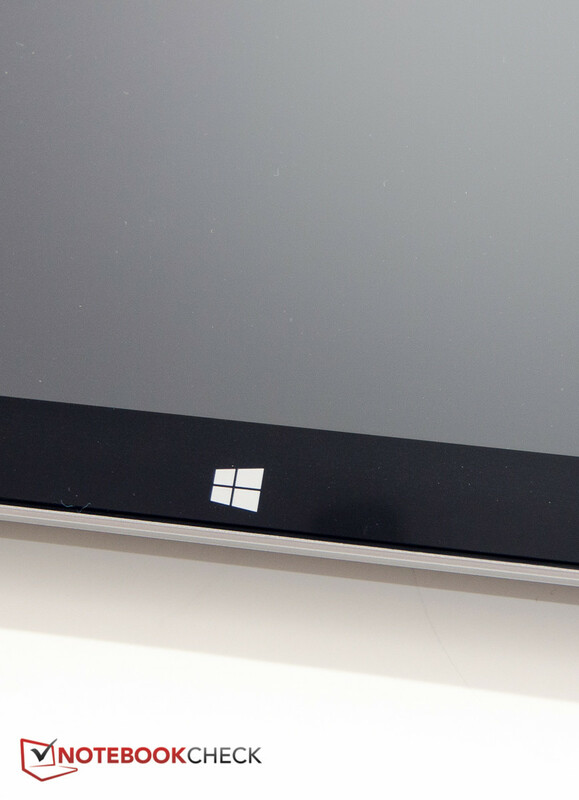 The black bezel is about 22 mm wide and houses the Windows button on the bottom bezel. This button also offers tactile feedback via an integrated pager motor. The build quality is OK, although the design doesn't look particularly upscale. The Horizon 2e is torsionally also a little less rigid than Dell's much thinner, but aluminum-clad XPS 18, although this doesn't negatively impact usage at all. With a footprint of about 526 x 319 mm, the Horizon 2e takes up as much real estate on the desk as four Apple iPads would and - at 4.6 kg - it's twice as heavy as the 18-inch Dell XPS 18, although the Sony Vaio Tap 20 is heavier still by another 0.4 kg. While the Horizon 2e is certainly semi-portable, we wouldn't advocate it as traveling companion. Moving it from room to room, however, is not really a problem. 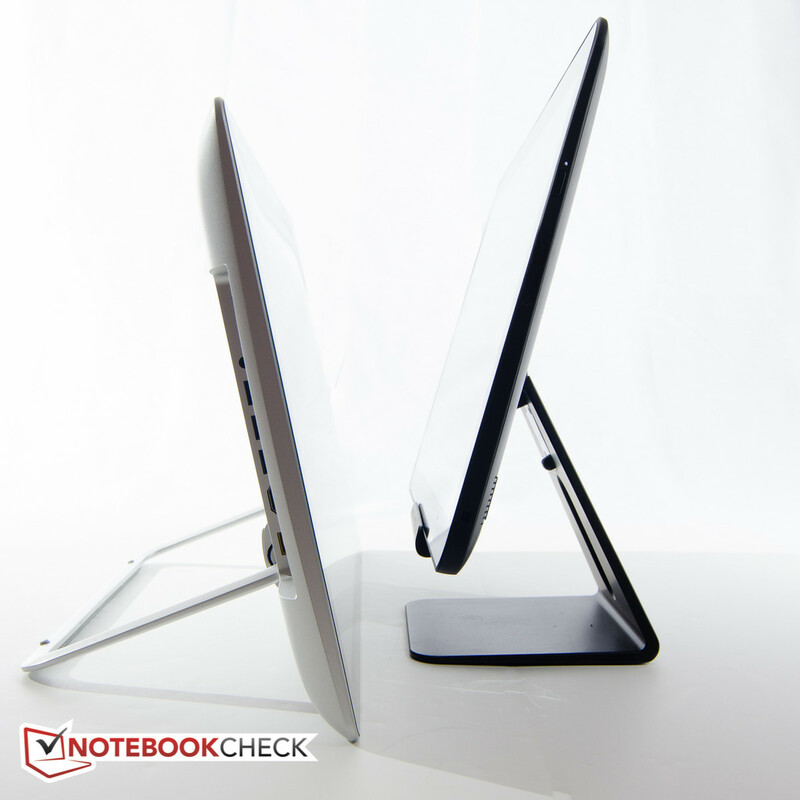 We found it easiest to grab the stand with one hand and support the edge with the other. All interfaces are located on the back about 6 cm inwards from the left edge towards the center, which means we had to get up every time we wanted to attach a device or cable. The advantage, of course, is that it's very unlikely to accidentally snap of a device or damage a port that way. We should also add here that the video port is actually HDMI-in and therefore designed to hook up other devices such as DVD players or game consoles. The sole connectivity to the outside world consists of a RealTek RTL8821AE 802.11ac 1x1 combo module, which supports both 2.4 GHz and 5 GHz. Bluetooth 4.0 is on board as well. We had no issues with the reception strength and never had any problems or dropped connections during our time with the review model. Lenovo bundles both an AccuType wireless keyboard as well as a wireless mouse. Optional accessories include a joystick, striker, and e-dice, which directly interact with touchscreen or application/games. The joystick/striker combo (2 sets) sells for $50. Unfortunately, our review model did not come with the accessories, so we couldn't check out the functionality they provide. 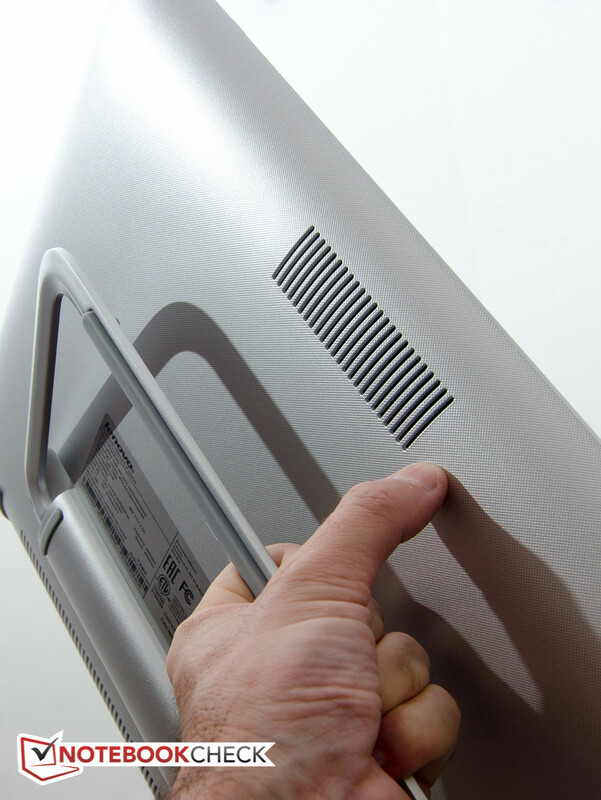 According to the hardware manual, access to the hardware requires the removal of only two screws. Unfortunately, the back cover resisted our efforts to remove it and we stopped to avoid any damage. 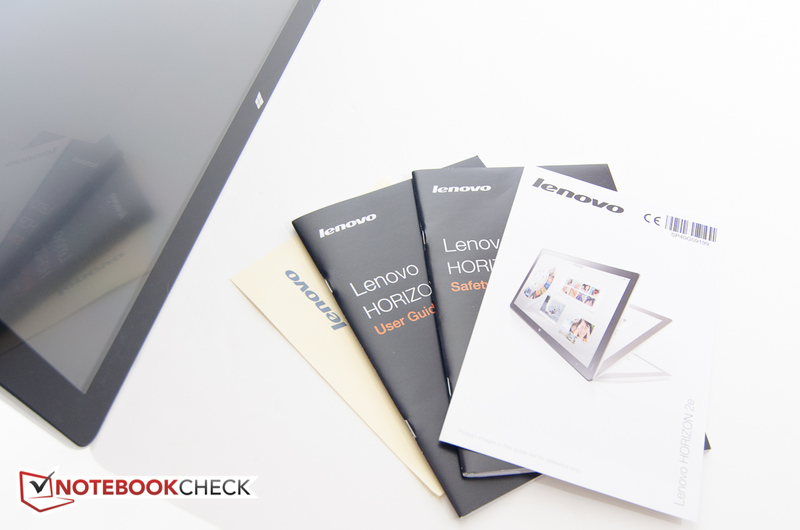 Lenovo offers a 12-month warranty against manufacturer's defects. At the time of writing, the online configurator did not allow us to choose longer or different warranty options. 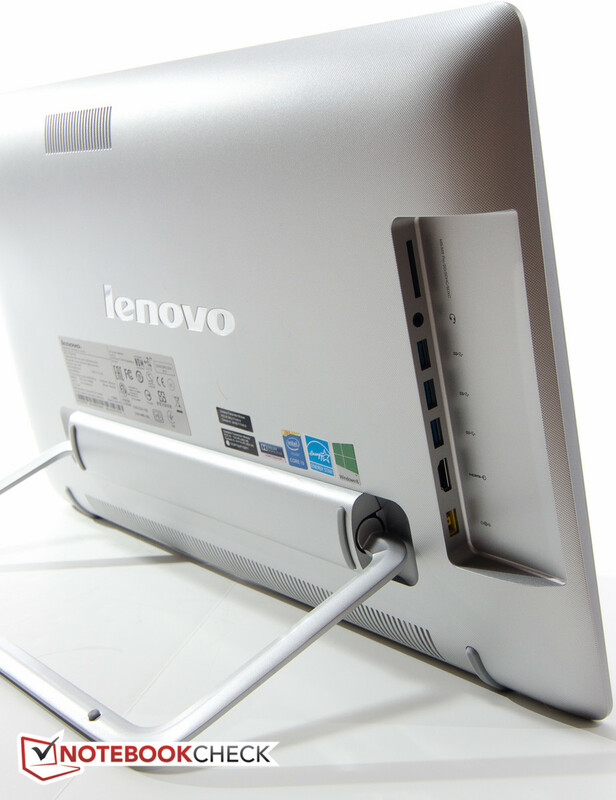 While the Horizon 2e functions just like any Windows 8 machine when it's propped up on its stand, putting it flat on the table automatically launches Lenovo's Aura software, which runs on top of Windows. 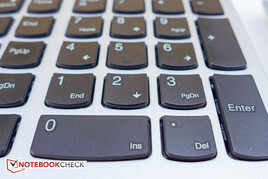 A silver-colored scroll wheel appears in the middle and allows the user to choose categories like Photos, Apps, Music, Games, and Videos. Tapping one of these categories in turn opens up a circular gallery of scrollable and clickable thumbnails around approximately half of the perimeter of the inner circle. With the AuraU app (Android only) installed on our Nexus 5 and with both the phone and the Horizon 2e connected to the same wireless network, the Aura software can establish the exact location of the phone when it's placed on the display and another media wheel appears. 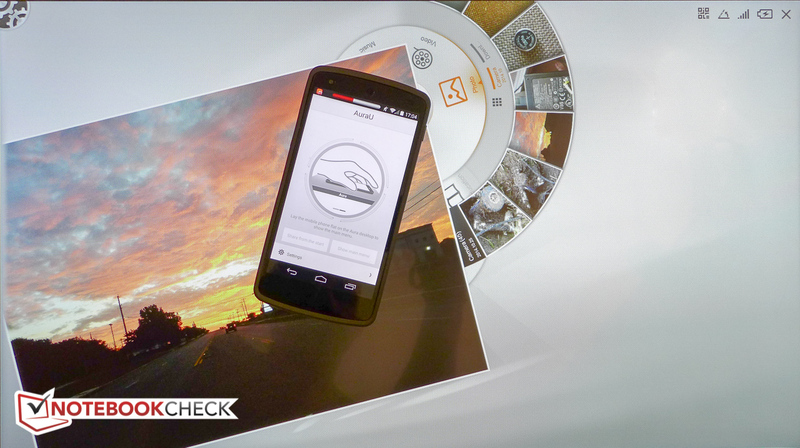 This media wheel then allows access to the phone's photos, music, and video files. Alternatively, shaking the phone results in pictures "falling" onto the desktop, from where they can be rotated, zoomed, saved, or emailed to other devices. While undeniably cool at first, the Aura interface is more of a gimmick in our opinion, although some users might make extensive use of the functionality. Additionally, Lenovo has preloaded a total of about 60 apps, including multiplayer games like Air Hockey. 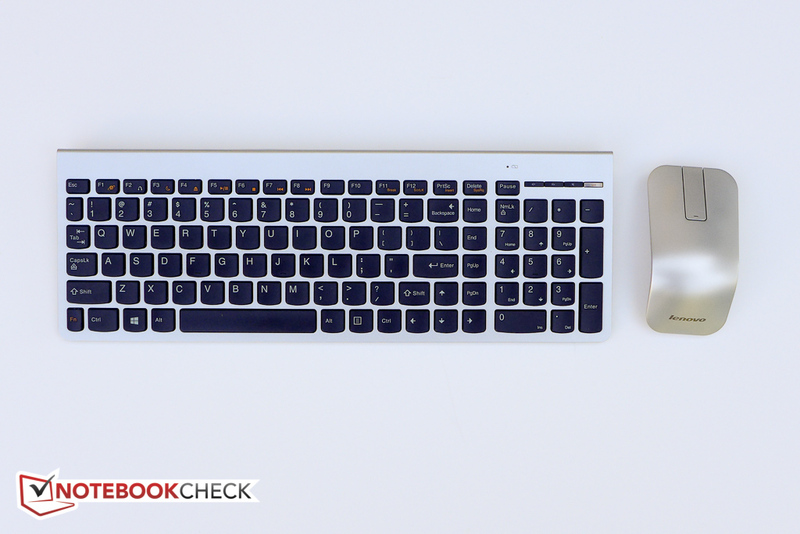 The bundled silver-colored chiclet-type keyboard features sculpted keys and a dedicated number pad. Both the key travel and the distance between the keys are perfectly adequate. The feedback of the keys is decent as well, but typing speed is hampered by the high amount of flex spirited typing will induce. We also didn't care for the undersized backspace and right shift key. Users not accustomed to Lenovo's somewhat non-standard layout might also have a hard time with the Fn key, as it is located where you'd normally find the Ctrl key on bottom left. The included 3-button mouse features a touch strip in place of the scroll wheel. The mouse works well, although the glide strips on the bottom are very small, which can lead to the mouse "catching" on some surfaces. The maximum wireless distance is also noticeably shorter then average, and we had reception problems when we placed the Horizon 2e on the floor with the mouse still on the desk. 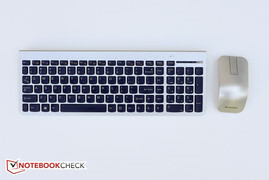 While the input devices are both functional, we are a little disappointed with the overall quality, since both the keyboard and especially the mouse feel rather cheap in our opinion. Give the price point of the Horizon, we would have expected more here. With the Horizon 2e placed flat on a table, the touchscreen provides the most intuitive way of interacting with the device. Operating the 10-point multitouch display was a pleasure, as our inputs got translated quickly and reliably without any lag. Edge control is also very smooth and predictable. 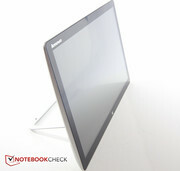 The Lenovo Horizon 2e comes with what appears to be an IPS display, although Lenovo makes no such claims on their webpage. Our software was not able to determine the exact panel name, either, and the type is simply identified as "LEN8000". 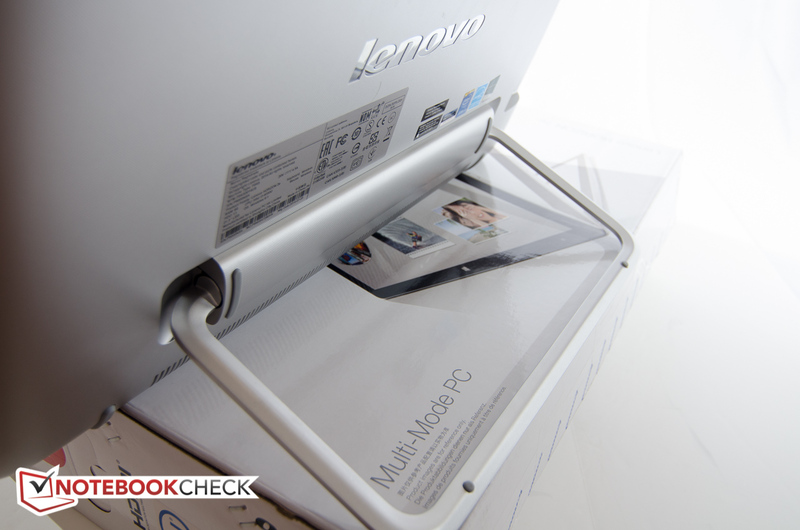 The screen has been treated with an anti-glare coating, which makes it much less susceptible to reflections than the glossy displays of both the Dell XPS 18 and Sony Vaio Tap 20, although the screen is not completely matte. The resolution of 1920 x 1080 is higher than the Sony's 1600 x 900 pixels, and results in a pixel density of about 102 ppi. While this is quite low for a tablet, many regular monitors in this size sport the same resolution, so this is not much of an issue when working with the Horizon 2e. 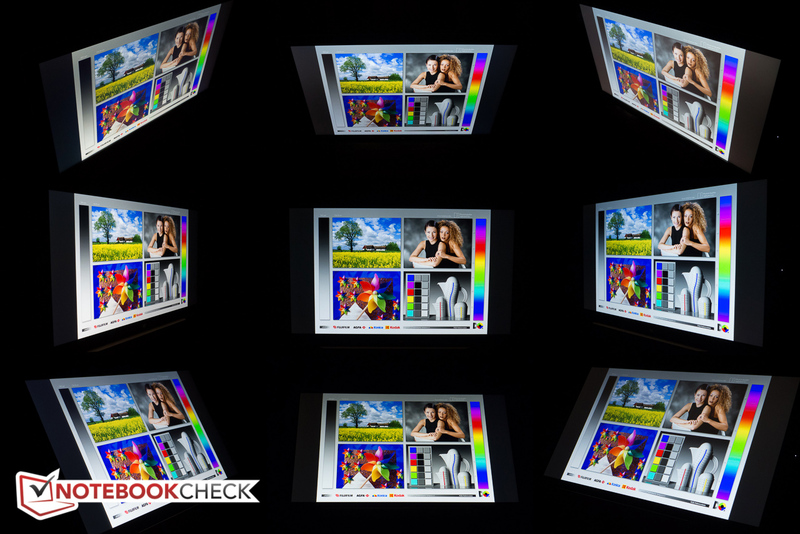 Unfortunately, the display is very dim with an average brightness of just about 183 nits, which pales in comparison to the Sony at 232 nits and especially the Dell at over 300 nits. The Horizon 2e maintains full brightness while running on battery. 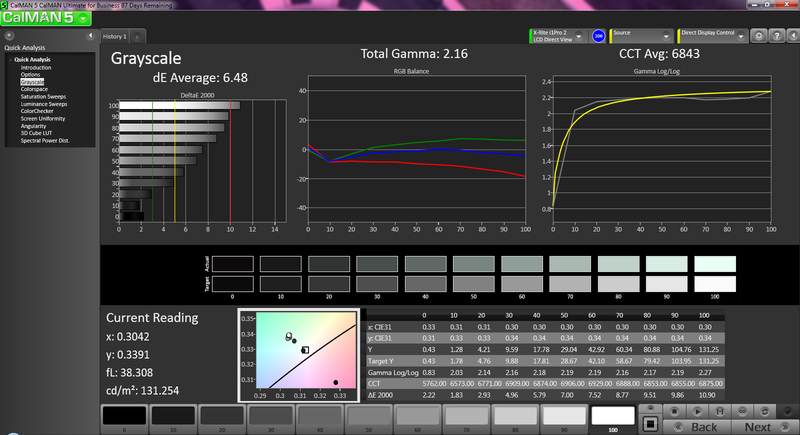 The black value and the contrast ratio are very good at 0.176 cd/m² and 1120:1. Blacks are sufficiently deep to look good when watching movies and don't fade to gray like we so frequently see. 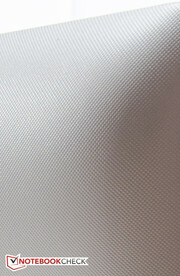 The Vaio Tap does have a slightly better contrast ratio (1265:1), but not enough to be noticeable; the Dell's contrast trails the other two competitors. The professional color spaces AdobeRGB and sRGB are covered to about 53 % and 72 %, respectively. Both the Dell and especially the Sony show better coverage are thus be better suited for photo editing and graphics work. Our analysis with the X-Rite spectrophotometer showed average DeltaE deviations of 6.3 for color and 8.21 for grayscale. Interestingly enough, it's not the usual blues and purples that are the issue, but rather light brown and orange-yellow that show the highest deviations. Calibrating the display didn't improve the accuracy dramatically. 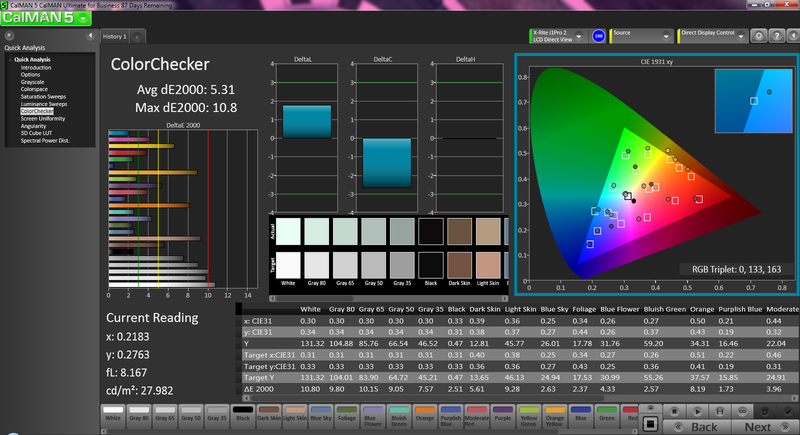 Users demanding a higher color accuracy should look at the Vaio Tap 20: its display, when calibrated, comes much closer to hitting the target values. Despite the fact that the display has an anti-glare coating, usability outdoors is restricted because of the low average brightness. Working in the shade is certainly possible, but direct sunlight and strong light sources behind the user need to be avoided. To be fair we should add that the average user will not most likely not take the Horizon 2e outside, so the low brightness is not as much of a concern as it would be otherwise. The viewing angle stability is very good, which again lets us suspect that this is an IPS display. The screen content remains legible even at very shallow angles. 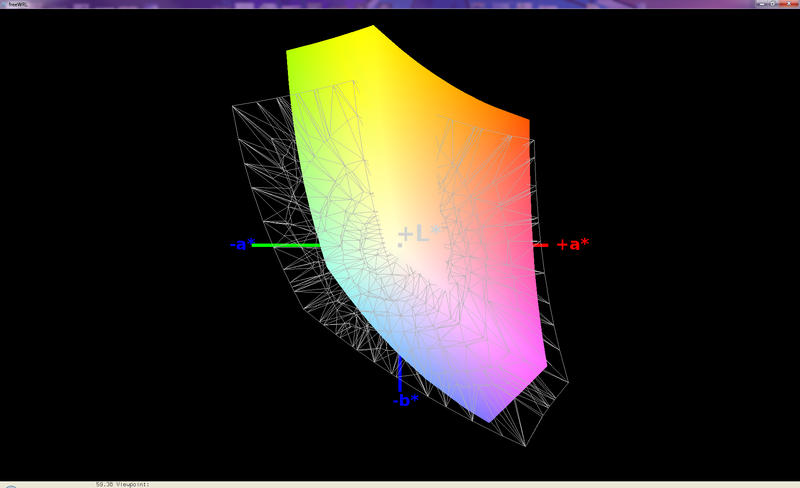 Although there is a slight loss of brightness, the colors remain accurate regardless of the user's head position. Our review model comes equipped with a fairly entry-level Core i3-4030U ULV processor, 4 GB of single-channel RAM, and a 1 TB conventional hard drive. As we mentioned earlier, the Horizon 2e is also available directly from Lenovo with either the same Core i3 process or a Core i5 processor. 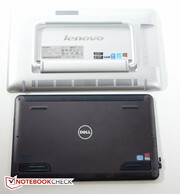 This versions offered online also ship with a 1 TB hybrid hard drive with 8 GB SSD cache. The Intel Core i3-4030U is an entry-level Haswell ULV processor. The CPU supports Hyperthreading and can handle four threads in parallel. Turbo Boost is not supported, so each core runs at the nominal 1.9 GHz. 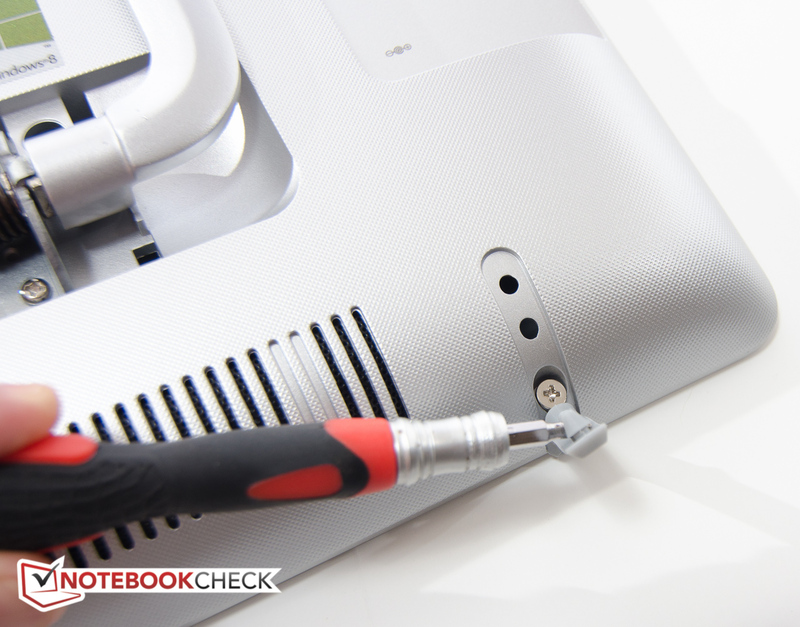 With a TDP of only 15 watts, the CPU is best suited for small subnotebooks and Ultrabooks, but is also frequently found in inexpensive larger notebooks. The results of the Cinebench R11.5 Multi-CPU test are in line with our expectations at 2.02 points. With 2.47 points, the older Core i5-3337U in the Dell XPS 18 easily outperforms our test candidate thanks to its Turbo Boost. Full performance was available regardless if the Horizon was plugged in or running on battery. At no time - not even during our demanding stress test - did the CPU exceed 65 degrees C, which is a very good result. 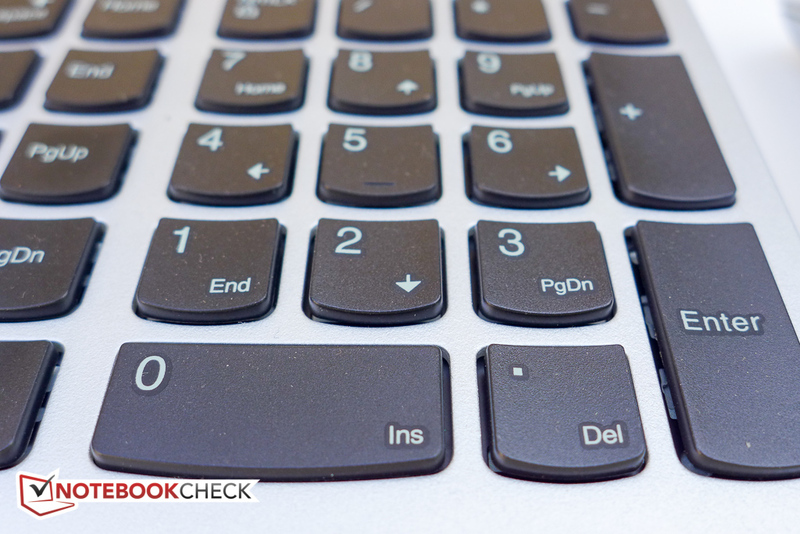 We use the PCMark benchmark tests to evaluate system performance. Although the conventional hard drive still offers a fairly satisfying user experience without significant lag times, the result of 2010 points for the PCMark 8 home test is 8 % lower compared to the similarly equipped HP Pavilion 13-a000ng x360 Convertible, which has a 500 GB hybrid hard drive, however. The Creative and Work scores are lower by about the same margin. The PCMark 7 score of 2426 is also quite low and trails the i5-equipped Dell XPS, which has a conventional hard drive plus a 32 GB mSATA caching drive, by a large margin (4231 points). The storage sub-scores are especially telling with 1539 vs. 4357 points. During our CPU stress test with Prime95 only, the Intel Core i3-4030U maintained its maximum speed of 1.9 GHz for both cores. Even after an extended period, the temperature of the processor never exceeded 61 degrees C. With only Furmark running, the CPU dropped to 800 MHz with the GPU operating between 850 and 900 MHz. The maximum GPU temperature never exceeded 65 degrees C.
When we ran both Prime95 and Furmark in parallel, the CPU cores dropped to about 1200 MHz and remained there for the duration of the test. The GPU again fluctuated between 850 and 900 MHz. The temperatures of the CPU and GPU did not exceed 65 degrees C even after several hours. 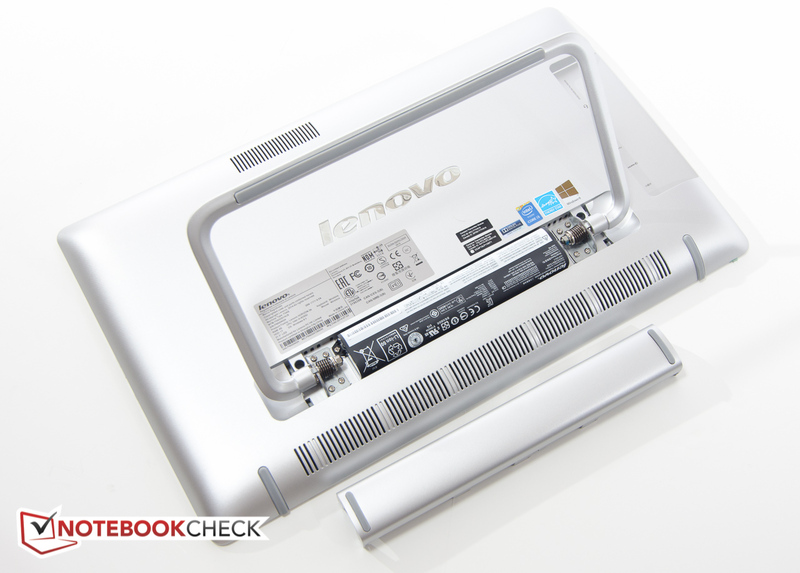 It seems Lenovo designed the Horizon 2e to remain cool rather than trying to tune it for outright performance. A repeat of the 3DMark 11 benchmark immediately after the stress test showed no difference in performance compared to the test we conducted after a cold start. The WDC WD10JPVX-08JC3T5 is a 1 TB hard drive with a rotational speed of 5400 RPM. Although the benchmark results don't reflect it all, the perceived performance was still acceptable despite the low average transfer rate of 86 MB/s and the recorded access time of 18.2 ms according to HD Tune. The Horizon 2e is positioned as a multimedia device, which probably explains why Lenovo prioritized storage capacity over access and execution speed. The model with hybrid hard drive (only available online) should offer better performance, although we'd like the option to choose a SSD drive during the configuration process as well. The integrated HD Graphics 4400 supports DirectX 11.1 and is capable of theoretical clock speeds of up to 1000 MHz. During our test with various tools, we never recorded speeds above 900 MHz, however. The 3DMark 11 score of 785 is exactly where we would expect it to be; the scores of 3DMark Ice Storm (30261 points), Cloud Gate (3578 points), and Fire Strike (479 points) are also unremarkable and almost identical to the scores of the Acer Aspire V3-371-36M2, which is equipped with the same CPU/GPU. The Dell XPS 18, equipped with an Ivy Bridge CPU and the older Intel HD Graphics 4000, scored higher by an average of around 10 % . The explanation: the XPS 18 not only has twice the RAM (8 GB vs. 4 GB), but the RAM runs in dual-channel mode and not single-channel, which impacts the performance positively. As expected, the Horizon 2e is not really suitable for gaming. An additional disadvantage is the limited number of resolution settings that the display supports. Bioshock Infinite on low, for example, requires a resolution of 1280 x 720 pixels, which doesn't happen to be one of the choices. The very common setting of 1366 x 768 pixels is also not available. Tomb Raider ran stutter-free at 36.5 fps with the settings on low and a resolution of 1024 x 768 pixels. Again we were unable to check the game's performance on medium and high presets, as both settings require a resolution of 1366 x 768 pixels. Although the fan of the Horizon 2e is running at all times, the system is overall very quiet. We measured a maximum of 33.1 dB during idle, which is a bit higher than both the Dell and the Sony. The whooshing of the hard drive is more audible than the fan under normal idle conditions, however. Under load, the system does not get much louder and we measured a maximum of only 34.8 dB. The frequency of the fan is very unobtrusive, so even extended sessions at maximum performance never get annoying. Both the Dell XPS 18 and the Sony Vaio Tap 20 emit around 40 dB under load. Even during idle, the Horizon 2e can reach temperatures of up to 36 degrees C on the back near the fan exhaust on the top. Both competitors stay markedly cooler and top out at around 30 degrees C (XPS 18) and 33 degrees C (Vaio Tap 20), respectively. During maximum load levels (stress test - Prime95 and Furmark running in parallel for at least one hour), the system reached an uncomfortable 47 degrees - again at fan exhaust location. The Sony gets about 1 degree C hotter, the XPS 18 reaches only about 41 degrees. Since it is unlikely that the Horizon is going to be used on the lap for extended periods of time, we don't expect this to be an issue - especially since high temps like that are unlikely to occur during normal use. (±) In idle usage, the average temperature for the upper side is 32.5 °C / 91 F, compared to the device average of 30.3 °C / 87 F.
The stereo speakers are located on the back and unfortunately don't sound quite as good as we had hoped for given that there seems to be ample room. The maximum volume level is not very loud, and although mids are present, the bass is clearly lacking. The sound quality is pretty decent, with no noticeable distortions, although to us it always sounded like the sound was coming from behind the AIO - which of course is the case. The sound doesn't change much when the Horizon is used in tablet mode, as long as it is sitting on a hard surface. 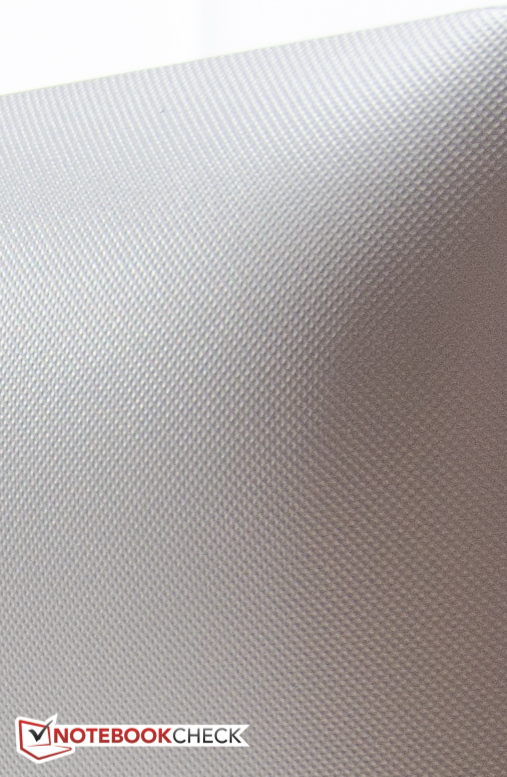 On softer surfaces like a couch, the sound is quite muffled. Lenovo claims runtimes on battery of up to 3 hours. Only during our Reader's Test (wireless off, maximum power savings, display brightness turned to the lowest setting) were we able to exceed the manufacturer's claim, as the Horizon shut down after about 3 hours and 30 minutes. During our more relevant WLAN surf test with the display set to about 150 nits, the AIO lasted only about 1 hour and 50 minutes. 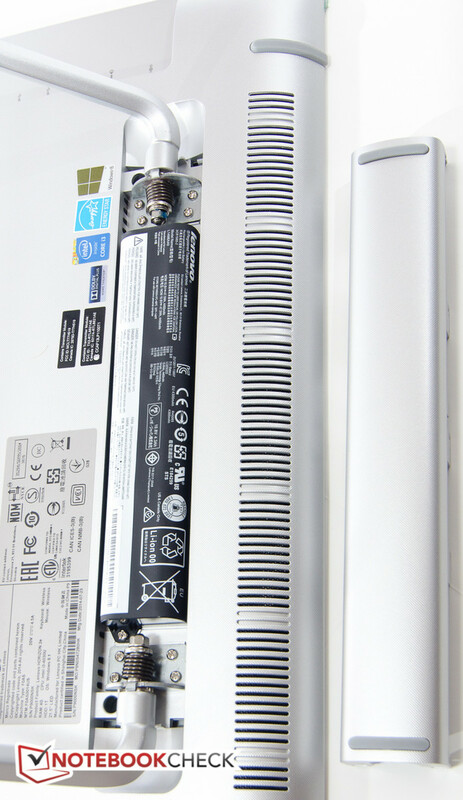 The Sony didn't last much longer, while the XPS 18 manged closer to 5 hours due to its smaller screen as well as the significantly larger batter (69 Wh vs. 47 Wh). Clearly, the Horizon 2e is not designed to be used without a power outlet in close proximity. Given the size of the AIO, we can't really fault Lenovo for making this design choice. 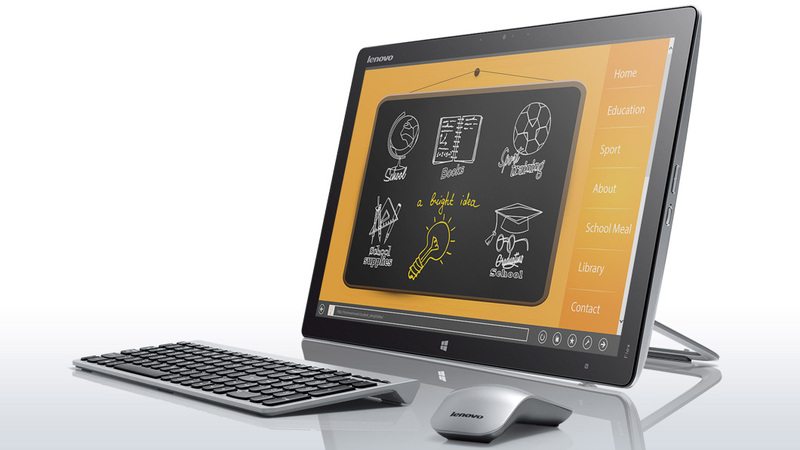 Lenovo's Horizon 2e is an interesting All-In-One design. The system is best used in a home setting, since moving it longer distances is a bit of a chore due to the size and weight. Unfortunately, we can't really comment on how well the system works as a tabletop PC for multiple users, since we didn't receive the joystick, striker, or the e-dice. The Aura interface is an interesting software add-on, which allows the user to access the media on the system itself or an Android device in a unique and quite futuristic way. We found ourselves using the stand mode a lot more frequently, however, as we couldn't find that many usage cases for a jumbo-sized tablet. Performance is adequate for the home user, though gaming enthusiasts need to look elsewhere. Despite minor quibbles, the keyboard and the mouse are decent enough and should suffice for most users. 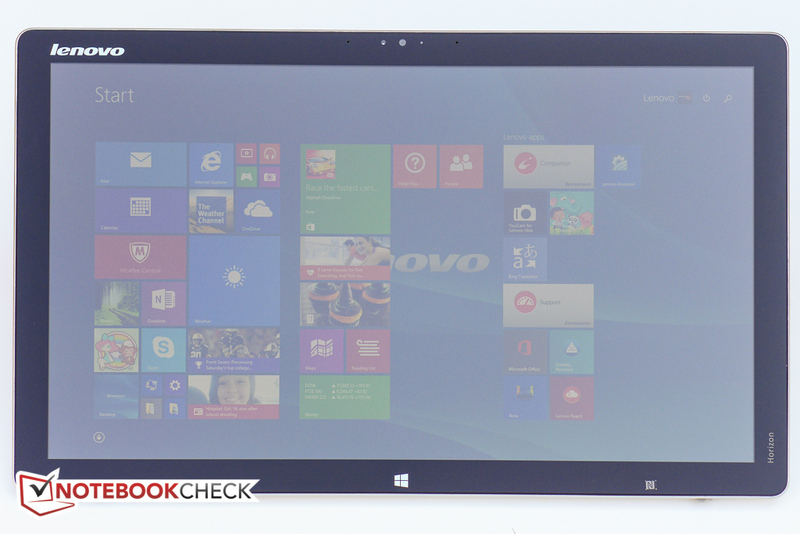 The display suffers from low brightness, even though the viewing angles are great. Although the battery life is not terribly exciting, we are not sure that longer runtimes are really required for this type of device. In fact, some users might just want to consider a regular AIO without a battery. 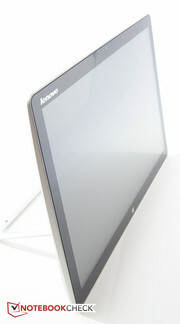 Lenovo's own B40 All-In-One, for example, has a more powerful Intel Core i3-4150T CPU with Intel HD Graphics 4600, a 1 TB 7200 RPM drive, integrated DVD RW drive, and sells for just over $700. 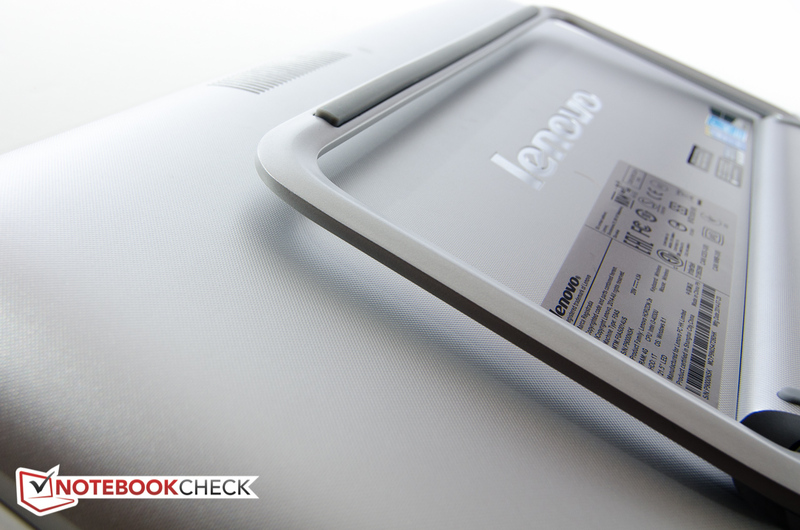 In Review: Lenovo Horizon 2e-F0AS0014US. 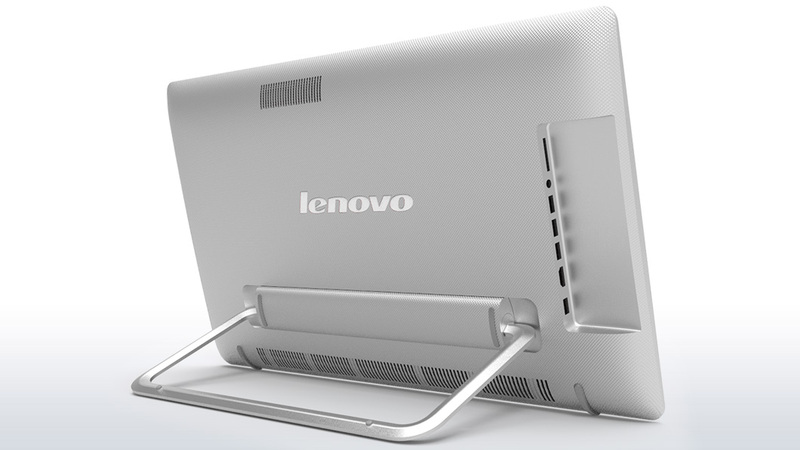 Test model provided by Lenovo U.S.
...with an adjustable stand and a build-in battery. The maximum angle is 73 degrees. With the optional stand, the Dell XPS sits a bit higher. 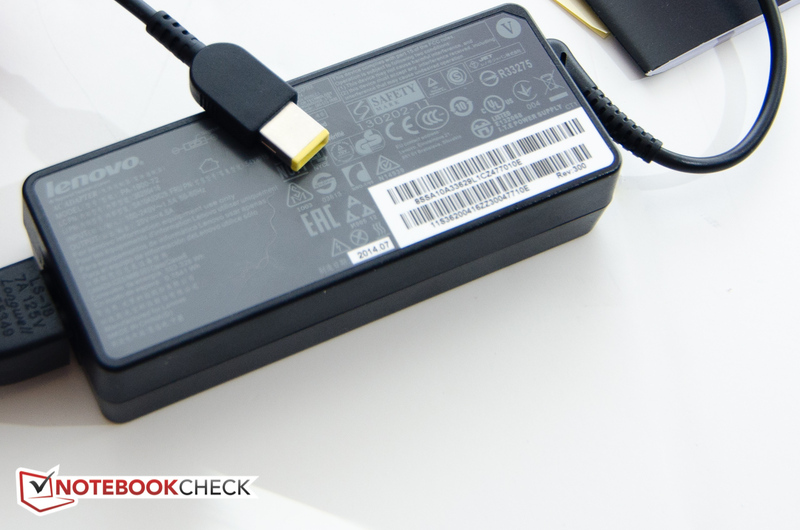 The power adapter with the new square connector is rated at 90 watts. The back plate can be detached after removing two screws. The plastic on the back is textured, so fingers don't slip easily. We found it more secure to use the stand as a handle. 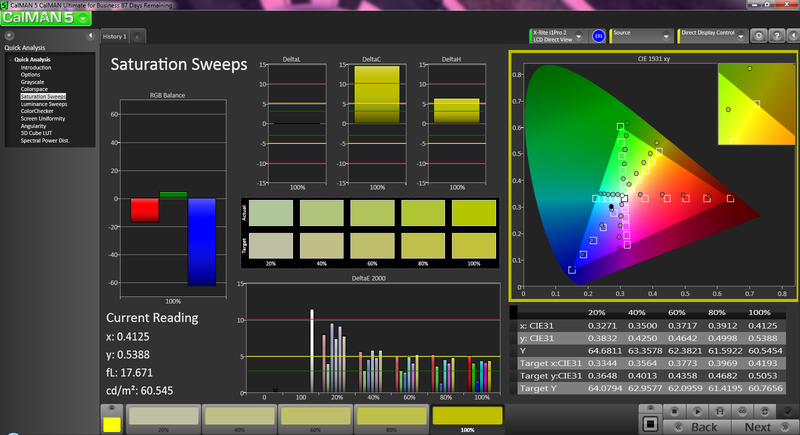 The display's non-glare coating and the innovative Aura software. A brighter display is on top of our list. An SSD or at least a hybrid drive would definitely improve performance. That Lenovo doesn't offer a wider range of configurations with different hard drive sizes and types, RAM, etc. The 20-inch Sony Vaio Tap 20 and the 18-inch Dell XPS 18.